When a recipe refers to neutral oil as an ingredient, it most often takes sunflower seed or grapeseed oils as examples. Until recently, I preferred using a perfectly neutral grapeseed oil for making my green herb oils, because it never interfered at all with the herb’s original flavor. A few weeks ago a friend of mine gave me a bottle of her very special grapeseed oil, which already blew my mind just after screwing off the plug when I smelled its scent. It has a very strong (and addictive) nutty scent (somewhat similar to walnut) mixed with an aged red wine perfume. The flavor of this grapeseed oil is extremely rich and combines (similarly to its scent) the aromas of red wine, grapes and nuts. Due to its quite unique flavor, I used it as an unusual “spice” in the appetizer below, featuring ingredients from the current autumn season. 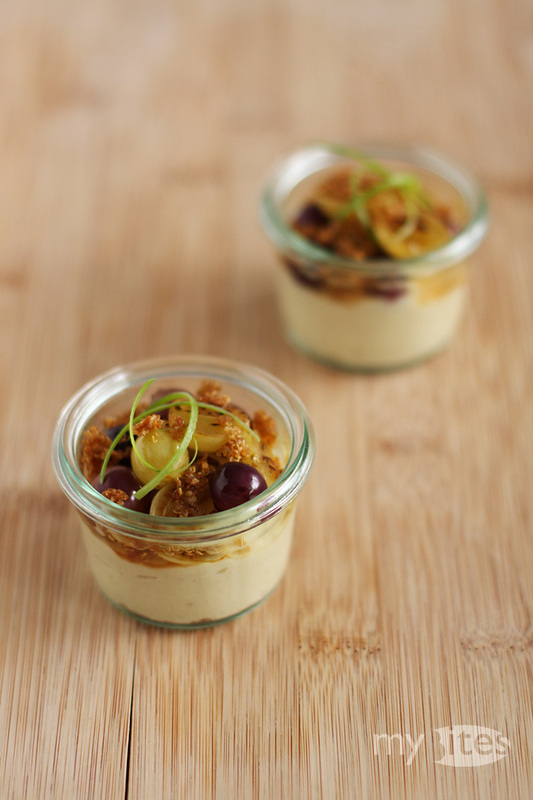 This entry was posted in Appetizer, Vegan, Vegetarian and tagged appetizer, celery root, fennel seed, fried quinoa, grapes, grapeseed oil, puree, quinoa, scallions, vegan, vegetarian, walnut oil on September 27, 2012 by Robert.